Heinrich, Will. “What to See in New York Art Galleries This Week: ‘Place/Image/Object’,” The New York Times, January 30, 2019. Franco, Josh T. “Role Call,” Emerging Artist Grant 2016 catalogue, New York: Joan Mitchell Foundation, 2018. Silva, Patricia. “Sightlines,” Emerging Artist Grant 2016 catalogue, New York: Joan Mitchell Foundation, 2018. Alipour, Yasaman. “Artseen: I Am a Lie and I Am Gold,” The Brooklyn Rail, March 4, 2016. Taylor, Leah. “Fact, Fiction, Reality & Illusion: An Interview with Anna Plesset,” BlackFlash Magazine, Issue 32.2, p.10. Reprinted on ARTHAPS.com, May 2015. Gat, Orit. “Portfolio by Anna Plesset,” BOMB Magazine, May 12, 2014. Balestin, Juliana. “Anna Plesset at UNTITLED, New York,” purple.fr, February 7, 2013. Gat, Orit. “Highlights 2013,” Frieze Magazine, December 2013. Keeting, Zachary and Christopher Joy. “Anna Plesset at UNTITLED,” Gorky’s Granddaughter, February 2013. Lee, Nathaniel. 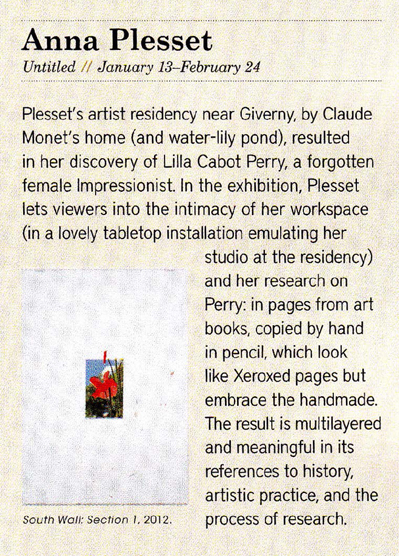 “Critics’ Picks: Anna Plesset,” Artforum, February 2013. Smith, Roberta. “Anna Plesset: ‘A Still Life’,” The New York Times, February 14, 2013. Wilson-Goldie, Kaelen. “Rumours & Recognition,” Frieze Magazine, October 2013. 208. Wolin, Joseph R. “Anna Plesset, ‘A Still Life’,” Time Out New York, February 14, 2013. Garza, Evan J. “Small Crowd,” New American Paintings, blog, June 28, 2011. Laurence, Robin. “Words become pictures in art shows around Vancouver,” The Georgia Straight, September 24, 2009. Laurence, Robin. “New inspiration at Vancouver’s inaugural drawing festival,” The Georgia Straight, July 16, 2009. Piseno, Tabitha. “Rotation X: Curating As Academia,” Bomb Magazine, December 9, 2009.